Beijing : US former Secretary of State Henry Kissinger on Thursday urged Washington and Beijing to resolve their differences as relations between the two countries soured in recent months amid a trade war and territorial disputes in the South China Sea. Kissinger is known for having played a vital role in the re-establishment of US-China ties more than 40 years ago during the administration of President Richard Nixon. "Both countries are two important powers and the US-China relations are of vital importance to both countries and the world," Kissinger said after meeting Chinese Foreign Minister Wang Yi, according to a press release provided by the state-run Central Global Television Network. 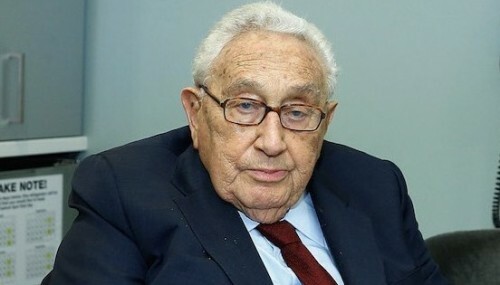 Kissinger, 95, added that it was necessary for the US and China to view the relations from "a broader perspective and to establish basic compliance" for the long term and stable development of bilateral ties, Efe news reported. Wang, for his part, said that China and the US should resolve their trade related differences through "dialogue and consultation on an equal footing". "Common interests of the two countries are far greater than their differences," Wang said, adding that cooperation was the only correct choice for the two world powers. The US and China have been engaged in an escalating trade war since July, when Trump imposed tariffs on Chinese imports in the technology sector, to which Beijing responded with similar measures affecting mainly agricultural products. The trade war coincided with tensions in the South China Sea, where US ships have entered waters that China claims as its own, and which Beijing has viewed as acts of provocation. On Tuesday, Chinese Vice President Wang Qishan said in Singapore that Beijing was preparing for talks with the US, which were postponed in October, to reach an agreement. The resumption of senior-level contacts came after a phone conversation last week between US President Donald Trump and his Chinese counterpart Xi Jinping, who could meet on the sidelines of the G20 summit in Argentina at the end of the month.